What is the degree programme about? American and English Studies focuses on the language, literature and culture of English-speaking societies. The degree programme is made up of four areas: linguistics, literary studies, cultural studies, and language classes. 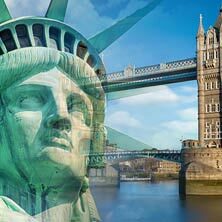 While English studies looks at language and culture in the United Kingdom, American studies focuses mainly on the USA and Canada. Other English-speaking regions that are an important part of the degree programme include the Caribbean, India, Australia and South Africa. Questions that are discussed in the degree programme include: what caused English to become a world language? How does the history of colonisation affect British and American identity? Why is Shakespeare a British icon and why are his plays still popular? How are different cultural groups changing American and British society today? How can a literary work have several very different meanings and how can I identify them? What role do popular novels and television series play in the formation of a national identity? As graduates of English and American studies are usually comfortable abroad and good at communicating, they are also in demand in international companies and non-governmental organisations. A doctoral degree may be an advantage in some industries, such as publishing, but does not guarantee the possibility of an academic career. Graduates who do not wish to become teachers should ensure that they gain additional qualifications and skills during their studies. This is usually done through work placements which can help you gain an idea of working life and form your own career goals. Good to excellent proficiency in English is required to study this degree programme and must be demonstrated in the qualification assessment process. You should be willing to read a lot and read closely. You should enjoy exploring other cultures and travelling, as an extended stay abroad in an English-speaking country is usually a key part of the degree programme. You should also aim to use the semester breaks to travel to English-speaking countries if possible and read books and watch films or television programmes in English during your free time. A varied degree programme with an opportunity to specialise: The English and American Studies degree programme provides students with a solid introduction to the subject and also offers the chance to choose one of the following six specialisations: General Studies, Cultural Studies, Linguistics, Literary Studies, American Studies, or British Studies. Innovative modules and a unique combination of subjects: Project work and independent study groups are a key part of the degree programme. Sub-disciplines that are sometimes kept apart (linguistics, literary studies and cultural studies) are combined in special interdisciplinary modules. Interdisciplinary collaboration and diverse theory and methodology: Due to the special focus on cultural studies, the degree programme also covers theories and methods from other subjects. Those studying the specialisation American Studies can take related seminars from other subjects, such as politics and international studies, if they wish. There is an opportunity to develop specific skills in linguistics by taking part in special events organised by the Interdisciplinary Centre for Lexicography, Valency and Collocation. There is a qualification assessment process for this degree programme. Information about the process is available here. If you are expecting most of the degree programme to consist of language teaching you will be disappointed. Good proficiency in English is required to study the degree programme and must be demonstrated in a compulsory qualification assessment process. *These courses are scheduled in such a way that the subjects can usually be combined without overlapping. The FAU website provides an overview of the current application deadlines as well as information on the selection process and how to apply. Please note: Despite careful checks, we cannot rule out errors or omissions. For this reason, all prospective students are advised to seek detailed information from FAU's Student Advice and Career Service (IBZ) before commencing their studies. And then become a taxi driver?